IRENE KRALIK (nee Panajoth) age 98. 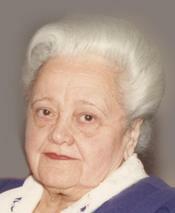 Beloved wife of the late Istvan; sister of the late Erno, Albert (Ilona), Zoltan (survived by Marta Laszlo), Ferenc and Andras Panajoth; aunt of Eva Reich and Ibolya (Dennis) Tarnay; great aunt of Nicholas and Eva Tarnay and Sylvia Kertesy Payne. Funeral service 11AM TUESDAY AT BODNAR-MAHONEY FUNERAL HOME 3929 LORAIN AVE. CLEVELAND where the family will receive friends 10-11 AM. Interment Holy Cross Cemetery. Contributions may be made to St. Emeric Church 1860 W. 22nd St. Cleveland, OH 44113.